BMW Forum - BimmerWerkz.com > Vendors > CARiD.com > Get your BMW lowered with KW Suspensions + New Offer at CARiD! 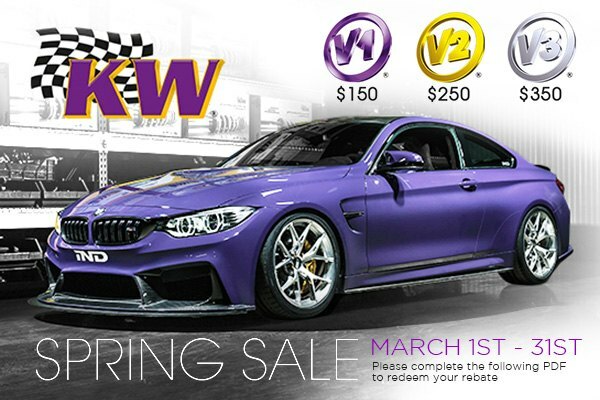 Get your BMW lowered with KW Suspensions + New Offer at CARiD! KW Suspension is a preferred choice by sports car manufacturers, tuners and drivers worldwide. Their coilover allow you to individually adjust the height of your ride without sacrificing on its handling, performance, and comfort. KW coilovers are designed to be a direct bolt-on replacement and include everything needed for installation. With any of KW coilover kits you will get much more than just a nice stance and sharp handling! Purchase KW Suspensions V1, V2 or V3 Coilover Kit and GET up to $350.00 rebate. Don't waste your time! This offer is valid through March 31, 2019. Please complete this PDF form and follow instructions to get your rebate.